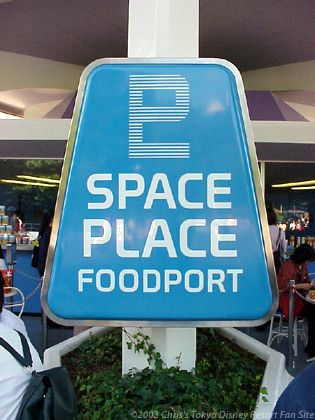 Space Place FoodPort sits underneath the StarJets (although I wouldn't recommend getting a bite to eat just before you ride the StarJets!). Although this would be considered a fast-food place, you can get some unusual items here like croissant sandwiches, Italian ice, chocolate cake and yes—even potato chips. Seating is all outdoors, but if the weather is nice and you can find a seat this would be a good place to stop for a late lunch or an afternoon snack. There's a lot of foot traffic that goes by this place, making it a good choice for people watching (good luck trying to figure out Japanese teenagers' fashion sense).